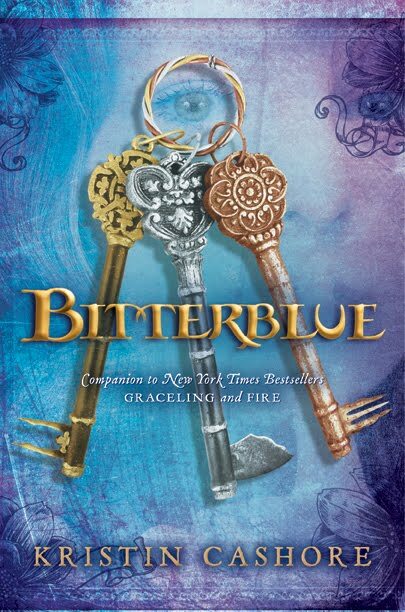 First Novels Club: BITTERBLUE: Signed Copy Giveaway!! 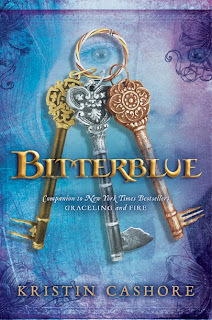 If you had a chance to read my review of Kristin Cashore's latest book, BITTERBLUE, then you know how much I loved loved loved this book. And if you had a chance to read Donna's recap of the Kristin Cashore signing we went to, you know how fangirly we got and totally squeed over the chance to finally meet one of our favorite authors. And now, you have a chance to get in on a piece of the action! While I was at the signing, I picked up an extra copy of the oh-so-lovely BITTERBLUE and had it signed for one of you lucky folks! And now I'm giving it away! Personally, I would like the Grace of speed reading, because I can't keep up with all the awesome books coming out! --Extra entries will be awarded if you help us spread the word about this awesome book through Facebook, Twitter, Goodreads, Blog Posts/Sidebars, etc.--just leave us links in the comments so we know. --Contest is open until Tuesday, 5/15. I'm always looking for new books to read. I would love to have the grace of being very good at sewing clothing. I'm very hard to fit and I would love to be able to do it myself! I'd want my grace to be something along the lines of perception-shifting. Thanks so much for the giveaway! I'd love to be Graced with a reliable attention span. Trifecta of shout-outs: blog, twitter & facebook. Yay! Grace of flying! I'm not a US resident (but also a mum, so I do get the diaperthing) so I'm not participating, but I couldn't resist answering anyway. Good luck everyone! I would like the grace of remembering what I read. Because then I could do anything. I'd love to win. I'd love to have a Graceling power of getting everything done but reading and writing with a point of a finger so I had more time for the things I love. I would want to have the ability to run extremely quickly. So quickly in fact, that I can run back and forth between continents in seconds. Like the Flash, really haha :) I hope I win! I love Cashore's writing, stories, and characters. My father does too so if I won this I know he'd get as excited as I.
I think it would be cool to have a grace that allowed me to kick anything exactly where I want it to go. Pow! Milk carton right in the kisser! I'm so excited to read this book! I just finished Fire, so I'm all ready to jump back into this world. :) If I had a Grace, I'd like I don't know, a photographic memory or something OR maybe an athletic Grace because I'm not very coordinated and I'd like to be. Haha. I have no idea - but I love the sound of speed-reading. I just can't keep up with my TBR pile!! What fun.... I'd love to be a mind-reader. That would be my grace. I can't wait to read this series! I kind of want to steal your super power but right now I would just like to be able to do 50 things at once - read, blog, change diapers, and play with my 3 yr old all at the same time! My Grace? Hmmmmmmmm the ability to know what is keeping a student from learning and how to help them! :) Cheesy I know! I'd choose the grace of healing, wouldn't that be awesome?! Haven't read Graceling but I have read Fire (one of my favorite books now). I really really want to read Bitterblue, so thanks for the chance. Hmm...and I think I would want the grace of writing AMAZING first drafts really really fast. Now that would be awesome. I would love for my grace to be memory. That would be amazing! Oh, if my grace was a photographic memory that would be AWESOME! Thanks for the giveaway! I would want the grace of speaking in many different languages fluently. That would be so cool. And very useful! Thank you to everyone who entered! I'll be emailing the winner shortly. Oh darn! I'm sad I'm too late, I would have loved a copy! I loved Graceling! I just read it in May. I would want my Grace to be the ability to communicate with others mentally. That would be soo cool.